3 Third party lenses: Tripod mount to NPP : L, L1 and L2. 11 Distance between the sensor to the nodal point. Thanks for adding your measurements. I have a question. I thought the degrees between the pictures would only be applicable to Fisheye lenses ? Does that also apply to normal lenses ? Or is the difference only noticable in Fisheye lenses, and too small have an impact on normal lenses. Sorry, I don't know if there is a difference between fisheye and normal lenses. For me it is more an information about the number of pictures needed for 360 degrees with enough overlap. These values are for portrait orientation. Probably we should make a third table with additional things like this then put all the informations in one table, isn't it? The text for this measurment includes "For fixed lens camera's this column is not applicable." Is this really true ? A lot of "Fixed" lens cameras do allow the addition of an adaptor tube which then permits the additional lenses to be added - whilst this implies that such cameras are not "Fixed lens" the way it reads now I suspect puts people off inserting a measurment for cameras which include a Fixed lens. Unless there is another reason I would propose to change the text to read; "Looking at the bottom of the camera, the distance between the middle of the tripod mount to the base of the lens base, or base for adaptor tube. For fixed lens camera's which do not allow use of adaptors this column is not applicable." Third party lenses: Tripod mount to NPP : L, L1 and L2. Problem : The list includes a number of "third-party" SLR lenses (Sigma, Tamron, Tokina, Zeiss, etc) which are available with different lens mounts (Nikon F, Canon EF, etc). Each distinct mount system usually has a different flange-back-distance (see http://en.wikipedia.org/wiki/Lens_mount#List_of_lens_mounts), ... which means that the L2 distance for nikon-fit Sigma 8mm f/4 will be different from the canon-fit version. Where the mount system is not known, this ambiguity renders the current L2 data less than useful. Proposed solution A : Following the example of http://olypedia.de/Nodalpunkte_E_System let L2 be measured from "NPP to image plane" (ie the sensor or film plane) because - to the best of my knowledge - this will be consistent for a given lens regardless of the lens mount system. Also let L1 be from "tripod screw to image plane". Task 1 : Updating L2 data for all the 'known mount' lenses is a simple job : for Canon-EF lenses add 44mm, for the Nikon-Fs add 46.5mm, for Minolta-AF add 44.5mm, etc. For the 'unknown mount' lenses, as I say, the current data is unusable, so no useful data is lost by switching over the image plane measurement system. Perhaps the 'ambiguous' data could be preserved - in the hope of future clarification - in a separate table, possibly here on the discussion page ? Task 2 : Updating L1 is simply a matter of subtracting the appropriate FBD from the current L1 value (eg: Nikon D90 = 40mm - 46.5mm = -6.5mm). The instructions for how to measure L1 could be updated to something like "measure from tripod to mount flange and then subtract the appropriate FBD ..." ? Task 4: Many cameras with fixed-on lenses will also have an exterior image plane marker (circle with a line through it), but IMO it would be easier to have a separate table for fixed-lens cameras which might as well indicate NPP to tripod socket (L) directly. Improved the table accordingly, I think it's better now. Assuming most are with either Nikon or Canon, the difference is just 2.5mm, so the data isn't useless. Most people's measurements accuracy is within this range, and the value is at least a good starting point. The number of pictures for 360° and the angle between two pictures doesn't depend only on focal length... It also depends on the size of the sensor. 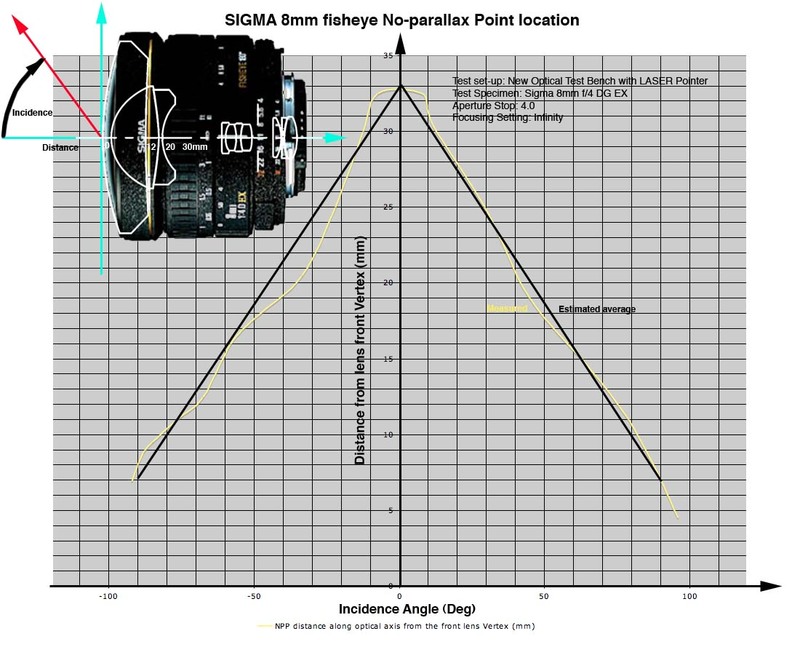 For instance the angle is roughly the same for 28mm on an EOS 5D (24x36 sensor) and 17mm on an EOS 350D (APS sensor). The Entrance pupil database needs constant enhancement. Please enter the NPP-settings you found for your camera. I just did some measurements and found an Entrance Pupil Length of 47mm for this lens. Since there are three other measurements I don't know what to put on the page. A number of fisheye and wide lenses show strong entrance pupil shift (See the animations on the web page by Pierre Toscani!!) by angle from center. I now always measure by observing the aperture from the front and with the lens stopped down. Measurements made with the lens wide open (Especially with the parallax method) may therefore differ from mine. This means the ideal NPP could differ slightly if you shoot wide open. The Nikkor AF 50mm f1.8D does this noticeably. The apparent aperture (50/1.8=27mm) is bigger than the shift, so I expect the difference is smaller than the DOF and not noticeable anyway. Distance between the sensor to the nodal point. I'am Daniele, daniele1357@hotmail.com, I am following the Entrance Pupil database from some time but I found, I think, a little bug in the way we consider the various distances. Mainly I think that is not a proper way of measure that from the lens mount border to the center of the stative mount screw, because the sensor is not located in that point, but little back. To let all the measures be usable it need to calculate also the distances from the mount screw and the sensor surface. What I mean is that a Canon EOS 7D using a Canon 15-85 lens at 15mm the Entrance Pupil is at 100mm from the mounting screw to the lens mount border, but in a EOS 550D the position can be different. So, the measure are valid only for the specific lens, specific camera at specific focal lenght. Correct?? Today I insert the Entrance Pupil Point position for the Canon 15-85mm lens, that was missing from the list. I would like to know if someome else take this measures, with the 7D and with other Canon body, just to compare the results and better understand the question. This page was last edited on 25 October 2016, at 21:55.